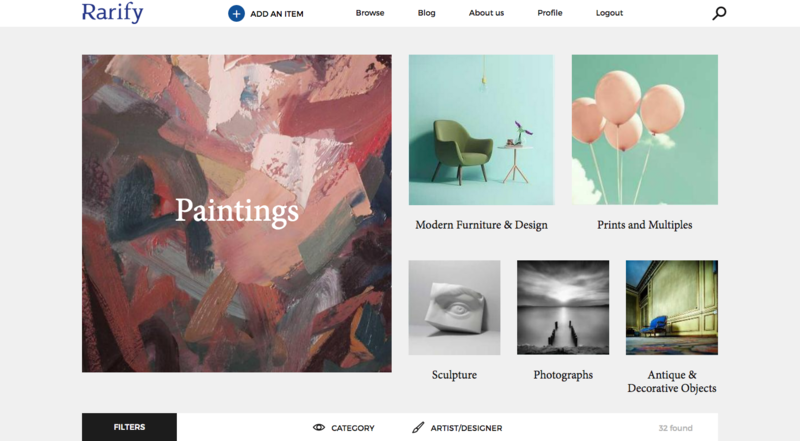 Rarify, a new website for collectors of art and design, launched today with the aim of connecting collectors around the world. The exclusive collectors’ community and art investment hub is a place where users can store and showcase their collections, find rare art and design works from internationally recognised artists and connect with like-minded collectors and industry professionals. Through a sophisticated recommendation engine, Rarify will learn a user’s preferences and recommend artists, designers and collectors they may be interested in. “We’re really excited to bring Rarify to the art and design world. It’s a place where collectors can showcase their collections and also meet others who share their passion. We’re excited about the energy that this community of collectors will bring with them,” said Paul Shanley, Rarify’s Founder. Shanley, an avid collector himself, started Rarify after realising that the options for art and design collectors to connect, find rare items and buy art were limited. “More and more people are choosing to invest in art and design. But the industry hasn’t really reacted to this and the tools available for collectors to find items they love haven’t really changed. By giving collectors a way to showcase their collections and connect with other like-minded collectors, we’re giving them the ability to find art and design items on an unprecedented level, some of which would usually never be seen on the market again,” added Mr. Shanley.